After my short, fab trip to NYC, real life has been a bit of a let down. Don’t get me wrong. I am glad to be home. Glad for the quiet and a chance to be in my garden. But not as glad for all the chores. Every once in a while I think I might scream if I have to wash another pan, do another load of laundry or sweep the floor…again. Of course I don’t scream. Instead I get a grip and realize how fortunate I am that I have a pan to wash and a floor to sweep! It’s also been a bit hard getting back into the swing of listing stuff in my stores (which can be tedious) and keeping on top of a few small freelance writing projects. I tried to give myself a little fun this past week by going to my neighborhood Goodwill a few times and even that backfired! Both visits (before 10:00 a.m.), the pickers were out in droves. Droves! (Who are all you people?) I think TV shows like “American Pickers,” the now defunct “Thrift Hunters” and even “Storage Wars” have sparked more interest in buying things to resell them. People from all walks of life and in every age range seem to be doing it. Anyway after thorough searching in all my favorite Goodwill sections, my basket was empty. That just about never happens. Finally, on my second visit, just as I was ready to leave the store, I spotted three of these vintage restaurant mugs that had been put out the day before. Not what I’m usually drawn to, but kinda fun. Would look good in some retro tiki bar. 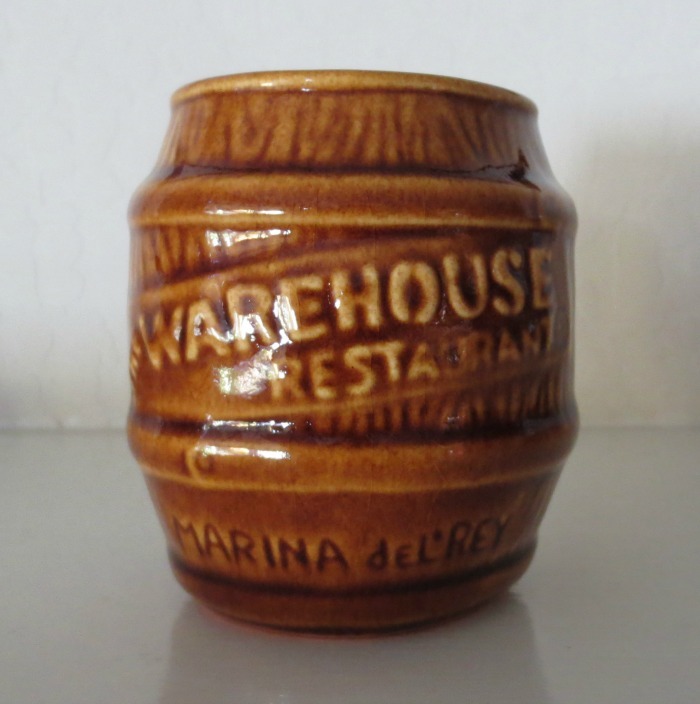 A quick Google search showed these “The Warehouse Restaurant, Marina del Rey” rum barrel mugs are listed for sale at $10-$20 each. And on Worthpoint, it shows that some have sold in this range. Well alright. These should do okay. But still I’m not super excited. But what I am really excited about is the upcoming holidays. I’ll be seeing my two brothers soon in Houston (we’ll have an early Thanksgiving together) and then in early December my youngest will be home from college! Been missing my little peanut (Don’t let her know I called her that!). Hoping for better hunting in the days to come!